I-Team: Over-the-Counter CBD Market Booms; Users Laud Health Benefits, But Are There Risks? Some are calling it a natural miracle drug for ailments ranging from joint pain to seizures and anxiety. Skeptics say it’s too early to “greenlight” CBD, known for its greenish hue. CBD is short for cannibidiol, one of the chemical compounds in the cannabis plant. Unlike THC, CBD does not produce a mind-altering high. The federal Drug Enforcement Administration classifies all cannabis as an illegal “dangerous” drug but has taken a hands-off approach where over-the-counter CBD is concerned. The result: CBD is exploding in popularity in the health and wellness market, where smoke shops, health food stores, day spas and pharmacists are carrying a dizzying array of CBD products, everything from oils to salves to capsules and gummies. “You’re not going to hallucinate, you’re not going to feel euphoria, you’re going to feel relief from your pain,” said Peggy Galant, who uses a CBD salve. The Tenafly, New Jersey, resident has chronic pain from multiple back surgeries and swears by CBD. “I get severe muscle pain and nerve pain and this helps both,” she said. Pharmacist Yaz Shah, who owns Hudson drugs in Cresskill, New Jersey, became sold on CBD after hearing testimonials from customers who tried products distributed by a company called Kannaway, headquartered in San Diego, California. Mindy Lomasky uses a daily dose of CBD for her 12-year-old son, Jake, who has severe autism. “He’s generally on the whole a bit calmer. I think it dials down his anxiety. He’s more focused,” Lomasky said. She said she doesn’t understand the stigma some associate with CBD. Michelle Steiner, a busy mother of four, said CBD oil has helped her with stress and alleviated her digestive problems. Englewood plastic surgeon Gil Altman said he began taking CBD several months ago for ulcerative colitis. Dr. Roshini Rajapaksa, a New York gastroenterologist, says there is a potential risk because the industry is unregulated. The FDA has only approved one prescription form of CBD, Epidiolex, for a specific form of childhood epilepsy. 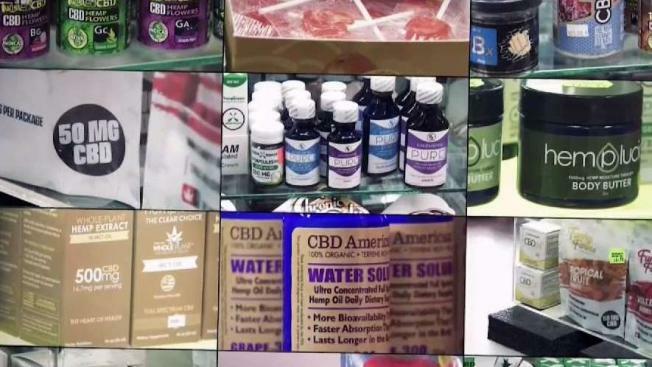 The I-Team went undercover to sample store claims about CBD and found one clerk who said their products were produced by the University of Maryland. A University of Maryland spokesperson said those claims are all false. The FDA has warned several companies to stop making misleading claims about CBD products. A number of reputable medical centers are doing research into the safety and effectiveness of CBD. One business report predicts the industry could hit $22 billion by 2022.